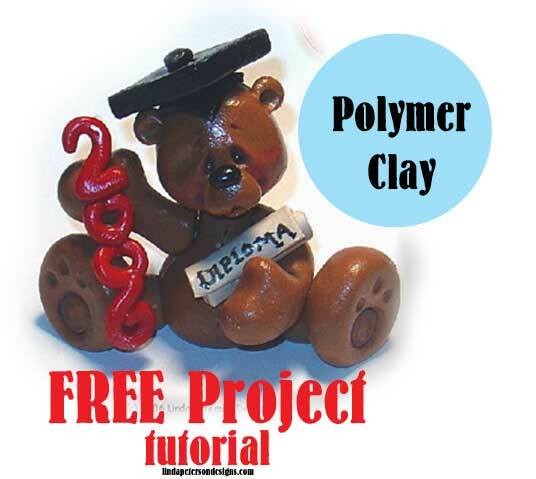 How to make a Polymer Clay Snowman and Penguin figurine – Free PDF Download + Pre Cyber Monday Sale! Yes, I’m having a PRE Cyber Monday sale! – Simply because….well…why wait until Monday? 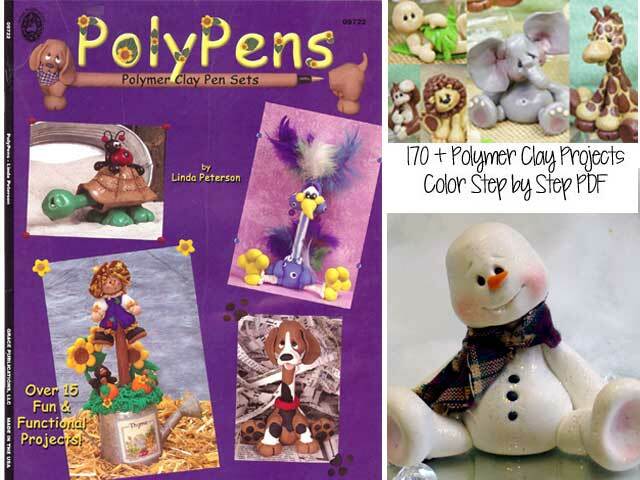 Here’s the details – My Most Popular Polymer Clay Projects all on one CD ROM is on SALE! Project of the Month Club CD ROM – Featuring over 170 projects to teach you how to polymer clay animals, dolls, functional decor, jewelry and more. You can use any brand of polymer clay such as Fimo, Sculpey, Kato, Cernit or Makin’s Clay. Each project is complete with Step by Step Color Photographs and detailed instructions in PDF format. PLUS – I’ll include a FREE signed complimentary copy of POLYPENS – one of my best selling books teaching you how to turn polymer clay into adorable ink pens to give as gifts to friends and family or simply have fun making for yourself. And to the first 15 people – I will have a FREE Google Hang Out – 90 minute class on Monday December 10 (don’t worry if you can’t make it – I will record it for you!) and we will create Sparkles the Snowman together! I’ll show you my signature 6 Simple Shape technique and at the end of the class you’ll amaze yourself by creating your own adorable Sparkles! Over 20 years ago, I tried my hand at making miniature dolls as a gift for my Aunt Molly when she came to visit us from California. Quite frankly, it scared me – alot! At the time, I had never really touched clay, except if you count when I was 2 or 3 sitting in the high chair playing with Playdough. I was caught up in painting T-shirts at the time, you know those beautiful glorious glittered t-shirts that we wore oversized and then though it was cool to pull them through an oversized bottle cap thing at our waist? What was I thinking? or was I thinking? and Who bought these!?!?!? – wow…just wow – that’s a whole other story…..
Anyways, I digress, I did have a small amount of experience in working with polymer clay because I was making – get this – COW EARRINGS – to go with my glittered – COW T-SHIRTS! So with that small amount of clay that I had, I thought why not give making dolls a try? I absolutely LOVED how the little doll turned out even though it had a face only a mother could love. I suppose it was the feeling of accomplishment. I was so excited though, that I called my Mom and said, we’re selling out out of T-shirts and going into the doll making business! And we did! For the next 15 years, I made dolls, cute animals and snowmen. Snowmen and all the little winter animals have become my all time favorite though and I can’t get enough. So just to get you in the mood and to get you started. Here’s a free Project of the Month Club sample – scroll down for the download link. 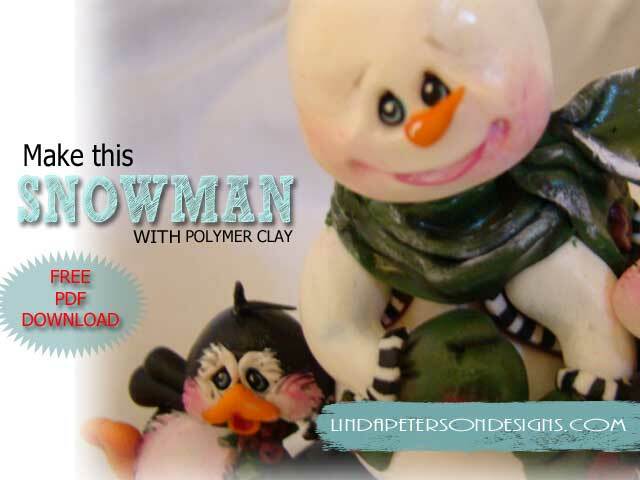 How to make a polymer clay snowman – Free PDF Download – Click here – and Please share this post with your friends! Faux stones are one of my favorites to create with polymer clay. The results are stunning and the technique is easy! The bezels designed by Susan Lenart Kasmer for Spellbinders® Media Mixáge™ make it so easy to get the look of inlaid turquoise without having to use a lot of tools. It’s a wonderful way to get the look of real stones without the cost or making the piece excessively heavy to wear. This is one of the techniques that I share in my book “Making Beads with Polymer Clay” by Cico Books. Follow myself and two other talented designers on facebook using hashtag #2lindasandaBeck You’ll love their work too!! Answer this question in the comments and be entered to win a Spellbinders Media Mixage bag of bezels: How would you use this technique? Cosmetic sponge 400 grit wet/dry sandpaper. Note: Condition clay until it is soft and pliable by flattening with a brayer and folding it in half. Repeat several times. You can also use a pasta machine to speed up the conditioning process. Creating the Faux Turquoise Roll a log of clay approximately ½” in diameter. Continue mincing clay into random shapes both large and small. If necessary dust the clay lightly with baby powder to keep the clay from sticking together as you chop. You should have random sizes and shapes. Using a cosmetic sponge apply black acrylic paint to all the pieces of clay. Gather these up, squeeze together and create a ball shape. Set aside to dry while working on bezel. Inlaid Pendant: Press a ball of green (non-patterned) clay into the desired size of the Susan Lenart Kazmer™ for Spellbinders® Media Mixáge™ Ovals One or Shields One. Make sure you fill the entire bezel with the clay and smooth. Trim edges if necessary. With Polyblade, slice clay ball in half to reveal pattern. 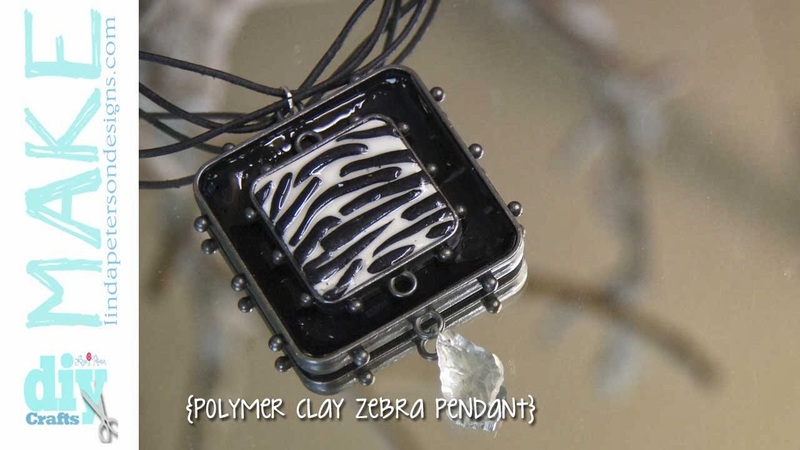 Shave off thin sections of patterned clay and apply to the clay on the bezel. Repeat this process until you have the desired patterned. Use brayer to set in pieces and smooth surface. Use the Polyblade to neaten up the edges. Bake the clay inside the bezel according to the manufacturer’s baking temperatures for the recommended length of time. Generally approximately 30 minutes. Allow to cool. Paint the gold nail polish onto the surface if desired and allow to dry. With wet sandpaper, gently sand the surface of the clay to remove excess nail polish, leaving it only in the crevasse. If a glossy finish is desired, paint the surface with clear nail varnish. 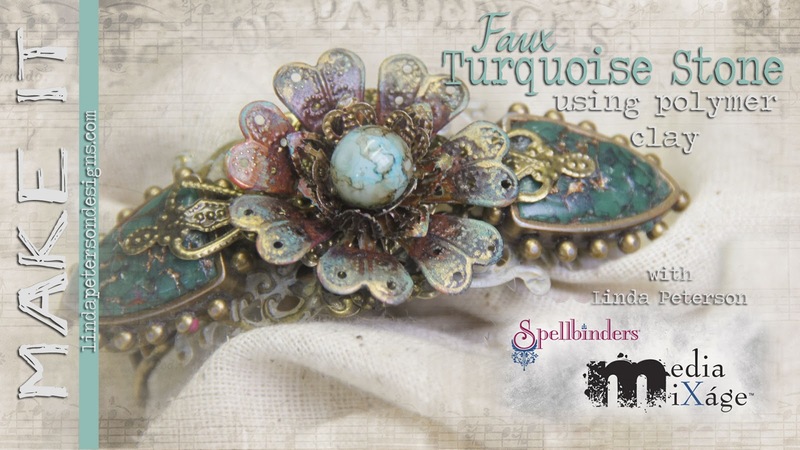 Assembly: Glue bezels onto desired filigree findings using jewelry glue. Allow to dry. Attach pendants to chain and finish with toggle.